28 Aug 2012 Could American Power Sink Any Lower? 27 Oct 2012 Did Obama Order Benghazi Stand Down? Russian and Syrian warplanes pounded towns in Syria’s opposition-held Idlib province on Saturday; merely a day after a summit of the presidents of Turkey, Iran and Russia failed to agree on a ceasefire. The world falls silent letting Putin kill civilians with impunity. Idlib is home to 30,000 Jihadists, some with al-Qaeda connections, as well as three million civilians. At least a dozen air strikes hit a string of villages and towns in southern Idlib. To include the town of Latamneh and Kafr Zeita in northern Hama where rebels are still in control. Syrian helicopters dropped barrel bombs on homes on the outskirts of Khan Sheikhoun in southern Idlib. Barrel bombs are crude devices filled with nails and pellets. The United Nations investigators have extensively documented the use of barrel bombs by the army. Russia says it avoids civilians and only targets radical al Qaeda inspired groups. The opposition and residents say most of the casualties in the last few days were civilians. The opposition accuse Russia and its allies of striking at hospitals and civil defense centers to paralyze life and force rebels to surrender. Thus repeating earlier, large-scale military offensives. The world falls silent letting Putin kill civilians with impunity. A rescue worker said that after Russian bombed a hospital in the town of Hass it became inoperable. There is coordination and cooperation with all the fighting factions to defend our people. A U.S. State Department official said Washington was aware of reports of Russian and Syrian air strikes in Idlib in spite of warnings from the United States, the UN and others, and was closely monitoring the situation. The world falls silent letting Putin kill civilians with impunity. Russia claims that it is targeting terrorists, but observers reported that only civilian casualties resulted from the strikes. This demonstrates that only a precise counterterrorism campaign can be effective. Indiscriminate regime and Russian military offensives will only continue to lead to humanitarian catastrophe. 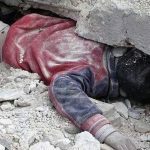 It seems the United States will just watch Putin and Assad massacre Idlib civilians. Tens of thousands of Syrians living in rebel-held towns in Idlib took to the streets to protest the impending campaign. Protesters vowed they would never accept Assad’s rule and would resist any offensive to retake opposition areas.